Our body cannot produce Omega-3 on its own and it can only be provided through diet or supplements. However, good amount of Omega-3 is not easy to come by; you will need to eat 32 oz of salmon every day to acquire the recommended dose of 1g Omega-3. Also, increasing sea pollution with mercury, lead, PCBs, dioxins has made us cautious about eating fish in large amounts. Fish oil supplements provide an effective way of acquiring Omega-3 without having to worry about sea contaminants. 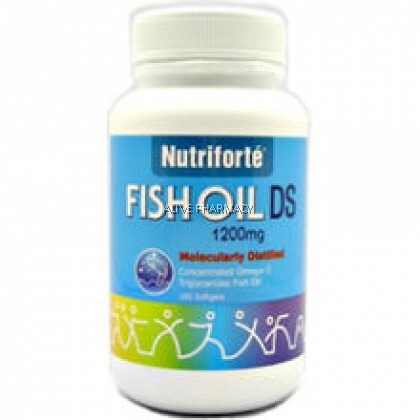 Why choose Nutriforté Fish Oil DS? Each 1200mg softgel contains 600 mg of highly purified EPA and DHA, which is twice the amount found in standard fish oils. This means less capsules and less cost for double the protection. Extracted from small fishes such as anchovies and sardine (Atlantic Ocean) to ensure high concentration of omega-3. Also, small fishes are lower on the food chain and thus have a lower concentration of contaminants. Goes through minimum 3 steps of purification and concentration at molecular level to remove contaminants. Every batch is independently tested for lead, mercury, arsenic, cadmium, PCBs and dioxins content. Better absorbed because available in triglycerides form. 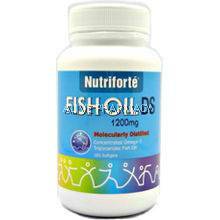 Most other fish oils are in the ethyl ester form with less superior absorption. Every batch is tested for peroxide value, a test to measure the rancidity reactions in the oils. This ensures that the Omega-3 oils are fresh and not rancid. Added with natural lemon flavour to mask fishy after taste.